Found in a park in Nanjing, China. Thank God for bilingual signs so there’s no confusion. 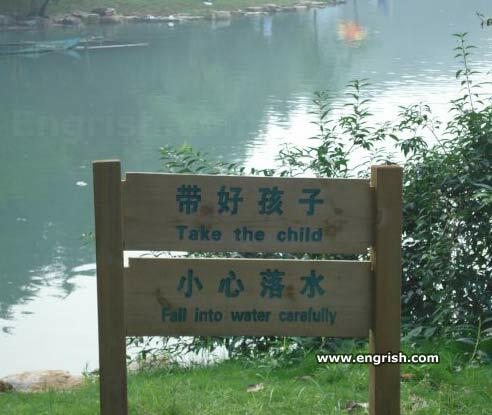 I guess throwing the child carefully is not a good thing. a dingo drowned my baby! @coffeebot. >.. Funny you should mention that case. From my point of view, there was equally strong evidence to disprove either the mother or the dingo murdered the baby. The minute the mother cried ‘Dingo took my baby’, the whole camping ground aroused, everybody was on alert searching (flash light on) for a baby, yet, the baby’s body was never found. It doesnt matter who, the mother or the dingo, did it, there is no way the mother or the dingo could/would have had the time to hide the baby’s body so well, so far, so secretive, that hundreds of searchers turned up nothing. That much for a suicidal kid-napper. Be sure to drown child gently. No littering of corpses.